My idea of a family Christmas has always included the extended family and friends. Visiting all the extended aunts and uncles and cousins spread across the city. Christmas morning was immediate family, the pub visit before lunch was with the immediately local friends, family, lunch was with the grandparents, and in the evenings we included friends, aunts, cousins (some several times removed). Visiting different houses was definitely good for us after a heavy lunch because we walked off half of it. Obviously, no one was fit to drive. Boxing Day continued along the same route, encompassing people from further afield, the next city perhaps. This will always be how I remember a perfect family Christmas. This ideal has waned somewhat in the last few years and it all has to do with people spreading further than they did in the past and the older generation leaving us for the Shimmering Realms. The older generations were the glue that kept us all together, the ones that kept us in personal contact rather than using electronic methods like email, skype and social media. I will freely acknowledge that if my Grandparents were still with us I would have been less eager to leave the UK. They were not technology savvy, and would have struggled with the concept of skype and email. My Mother’s family tree are nearly all within the confines of one county (with the exception of an aunt who moved to Dorset), My Father’s family are pretty much contained within one city. But now so many of us are spreading our wings to other places, not just me and my husband but the rest of our generation, we’re spreading our influence over a greater distance, into different cities, counties, countries and even continents. I have no regrets about moving out here at all, but I would like to recapture the feeling of the Perfect Family Christmas that I remember as a child. 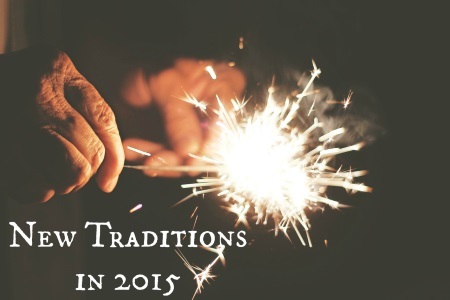 We are also trying to create a completely new set of family traditions (because not all traditions travel well especially when there is a big climate change). We will get there we just have to create that wonderful feeling in our own way in our new home. This entry was posted in Blog and tagged New Holiday Traditions by Mamie. Bookmark the permalink.